I’ve always had a fascination with planes. No matter if I am flying domestically in Australia or internationally, the buzz I get when I board a plane is still the same; if anything its electric. Recently I had the pleasure of experiencing Boeing’s new 787 Dreamliner when I flew to Bali with Jetstar for a relaxing stay at Bali’s new luxury hotel – Double Six in Seminyak. I was invited to take part in Boeing’s FlyTheDream campaign to celebrate the Dreamliner operating over 100,000 commercial flights (the equivalent of 415 round trips to the moon) and carrying over 20 million passengers (that’s four times the entire population of Norway). I was able to experience the 787 firsthand, both in Economy on the way to Bali and Business Class on my way home to Sydney. Seating 335 passengers, with 21 seats in a 2-3-2 configuration in Business Class and 314 seats set out in a 3-3-3- in Economy, the first thing that struck me on boarding was the abundance of space. And there was lots of it. 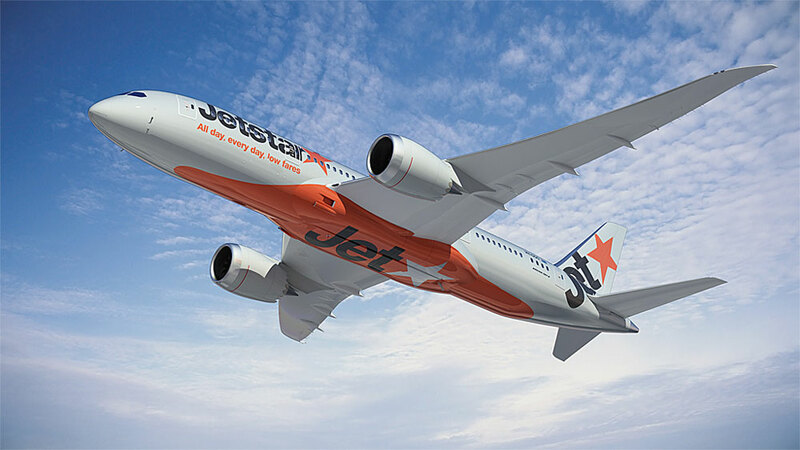 It’s sleek and clever interior design included responsive cabin lighting, customised orange lighting in true Jetstar style and a simulated sunrise to gently wake passengers on morning flights, which made all the difference when flying into Sydney on the red eye. There is nothing worse than being woken up abruptly by the flick of hospital grade lights in a pitch-black cabin. Walking up to my seat was notably pleasurable as the spacious aisle ensured I didn’t catch my bag on armrests and accidentally knock other people trying to take their seats, something which can get a little frustrating for both parties. Unpacking my inflight essentials from my carry on bag, I noticed there wasn’t the usual battle for stowage space. Taking a step back and looking at the cabin architecture and new stowage bin design properly, I marveled at the amount of room for baggage and felt a greater sense of space. No stressful ‘will my bag fit’ situations here! Taking my window seat on both routes - I am a sucker for a good window seat - my jaw dropped. The window was big. And I mean bigger than normal. Like, car window big. In fact, the windows on the Boeing 787 Dreamliner are 65% larger than other planes. Additionally, passengers are able to adjust the amount of light that comes through with an electronic control; it felt good kissing the archaic window blinds goodbye. For those lucky to travel Business Class, it is well worth it. In addition to priority boarding and priority disembarkation, a Business Class ticket on Jetstar’s Boeing 787 Dreamliner will see you get private seating, an exclusive Jetstar inflight amenity pack including a pillow, blanket, eye mask, lip balm, moisturiser, pen and an iPad case, as well as plush leather seating, in-seat power ports, personal 11 inch Panasonic screens for complimentary in-flight entertainment and a three course meal. It certainly makes the difference when arriving at your destination.